The foam set fits the IM2975 transit case and includes layers of pre-scored pick n pluck foam, the number of layers in each set depends on the depth of the case. Layers of foam to fit in the base of the case are cubed so they can be cut to snugly fit the contents. The number of layers depends on the depth of the case. 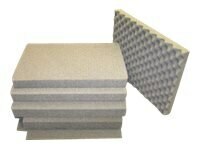 A convoluted section of foam is included for the lid.